My look of the day is from Christina Aguilera's new video Not Myself Tonight and it is another long awaited request from an ooold friend. In this video, Xtina is being her typical dirrrty self, thrusting her person and invading your space, but her makeup is en pointe. 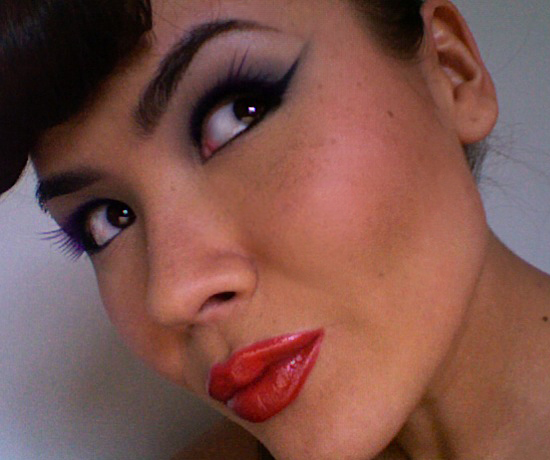 There are several distinct looks in the video, but the requested makeup was the one where she's wearing curled bangs and a ponytail a la the 50's. 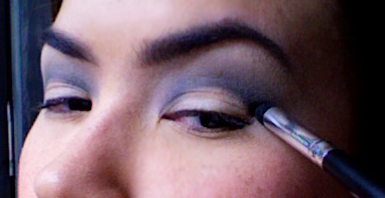 This look is actually my favorite from the video, and I think it's probably the easiest to replicate. So, let's get started!!! After applying primer all over my face (I used a sample from Korres ) and primer potion to my lids, I powdered my entire face, including lashes and lips using a powder puff (pictured). Next, I filled in my brows and emphasized the arch using a mix of gray and black eyeshadow on an angled brow brush (pictured). 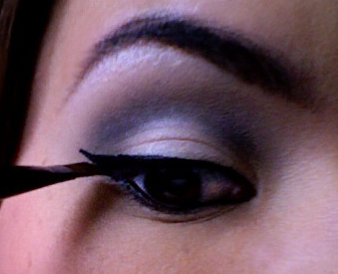 EYES: I used 4 shadows: a matte bone white, a matte gray, a matte black, and a shimmery white. 3. I packed the bone white color all over my lid and up to the brow. 4. With the gray shadow on a fluffy dome brush, I contoured my eye socket, going slightly lower on the inner and outer corners. 5. With the black shadow on a pointed dome brush (pictured), I "outlined" the outer and inner portions of the crease, making it sharper. 6. 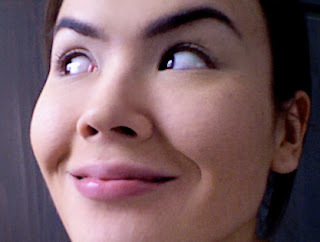 Next, I took some shimmery white on a flat brush and packed it on the center of the lid (pictured) and under the brow. 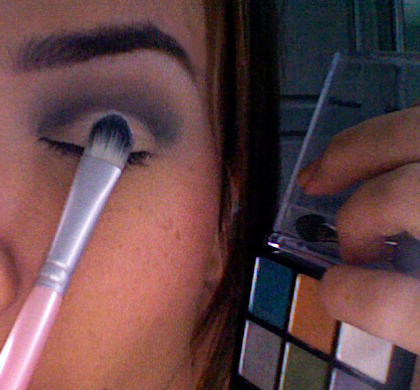 Tip: Make sure the brush has a fine edge (an old concealer brush is perfect) when defining the area under the brow. It makes for better control and precision of the application. 7. With a black gel liner on an angled liner brush, I lined my top lid and extended the wing. Tip: If you can't do this free hand, apply a piece of tape, from the outer corner of your eye across your temple and apply the liner, using the tape as a stencil. 9. Finalement!! Apply your lashes et vous êtes fini!!! The lashes, although not quite like in the original look, are FANTABULOUS!!! 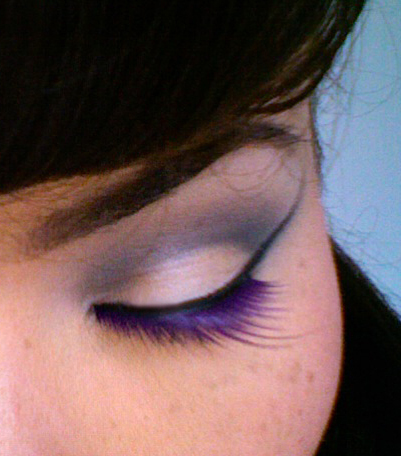 They are fierce and purple and give this look even more edge!!! Yeah baby!!! Where did I get them, might you ask...? @ Forever 21 bay bay!!! DON'T FORGET THE QUINTESSENTIAL ROSE BLUSH! 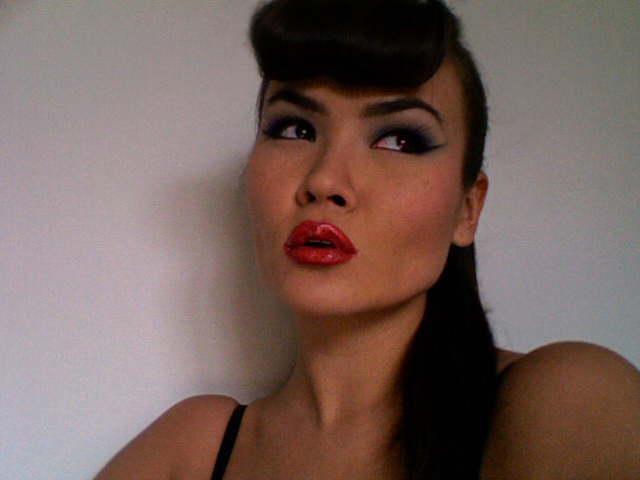 MY DEF OF A VINTAGE POSE... HA! wow Fantastic!!!!!!! I love this look I think it's the best one yet. It look sso great on you too. 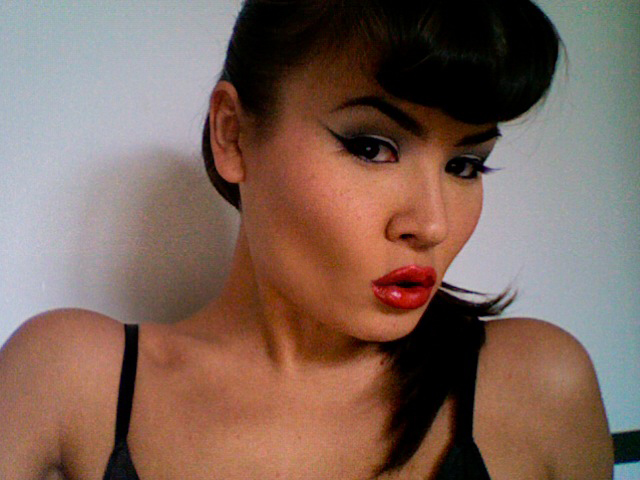 You should go out with your hair and makeup vintage style. 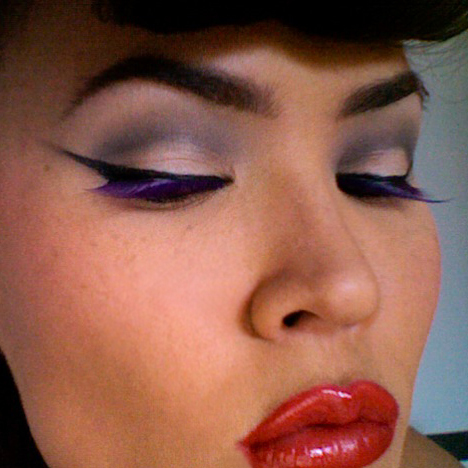 I especially love those purple lashes! Great job. thanks G :)) I had no idea vintage makeup would be so much fun!!! OMG! This is an epic post, Masha. And thanks for the gel liner application tip, too :-). I want you to make the last photo of you at the bottom your new profile pic!